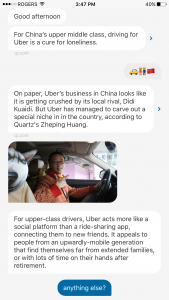 There are a lot of different ways to get your news but here is something…well…different. 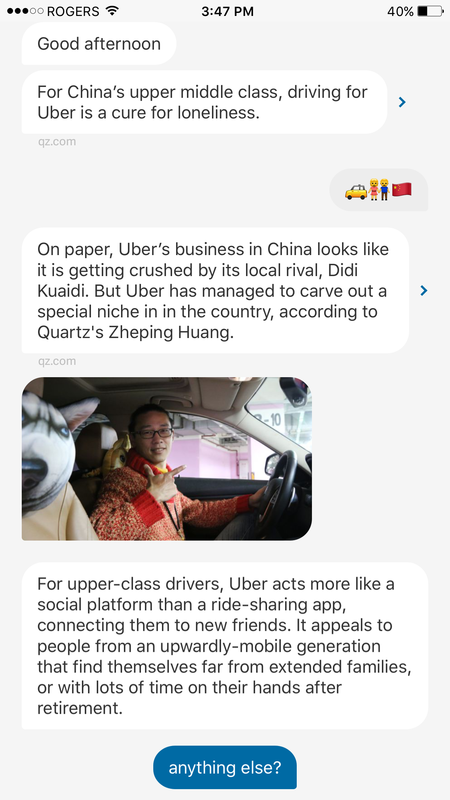 Quartz is an app that sends news teasers as friendly texts. It will ask if you want to know more or move on to something else. If you want to know more it texts again with info, images, video, etc. It is basically heavily digested news snippets but you can also click through to the source. It is pretty chatty and if it runs out of news it will give you a quiz or something else to do – try it out. 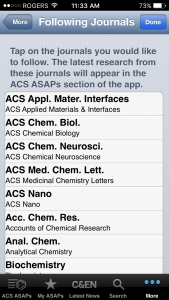 Do you want to stay up-to-date on your favourite journals from the American Chemical Society (ACS)? The ACS Mobile app might be just the thing you need. The Library has a full electronic subscription to ACS and you can take advantage of this all-access pass with this app. The first step is to select the journals that you would like to follow from their list. The latest content will be loaded, with easy viewing of article titles, authors, and colour images. An interesting article can be saved to the My ASAPs area for a later date, or you can click on a title to read the abstract. 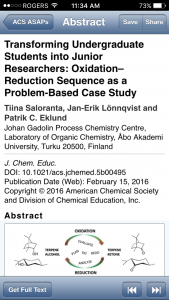 Selecting the full text option brings you to the published version of the article. Reading is a breeze with the pinch to expand gesture. 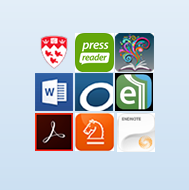 Be sure to download the AnyConnect app to be able to turn on the McGill virtual private network (VPN) and gain access to these journals on your mobile device (VPN info here). I had the habit of following C&EN in a browser and I’ve since moved to the app, although it does allow me to open articles in Safari. I find it much more comfortable to read the latest news headers on my phone now and I feel more up-to-date. I hope you will too! Let’s face it, this time of year can be stress-inducing: exams, projects to complete, holidays, New Year’s resolutions! We do have activities at the libraries that can help. For instance, the dogs will be visiting us, we have puzzle corners, knit knacks, and we’ll be opening the games exhibit for a fun afternoon next week at Schulich Library (Wednesday, noon – 2:30 pm). If you are never without your mobile device, you might also find these apps soothing. 1) TaoMix: This is where you build your own relaxing sound mix. Select different types of sounds, from birds and insects, rain and wind, to city and human noises (human heart), and then move each sound closer to or further from the inner circle to affect the volume. You can move on to other things and the mix will play on. I like the fire camp (it’s getting cold outside). 2) Pocket Pond: Drag and drop fish and lily pads onto your pond (and maybe take a few deep breaths). Create ripples in the water and feed your fish or just listen to the sounds of nature. For a little excitement turn the thunderstorm on from the options under ‘i’. There is now a Pocket Pond 2 but it is asking me to feed the fish every day and I can’t handle that kind of pressure right now. 3) Colorfy: A colouring book app for adults. It would be great to have time to colour in an actual book but this app does the trick. Choose from categories of pictures, including florals, animals, and gardens. 4) Jigsaw Puzzle: Jigsaw puzzles relax me but it is tough to live around a puzzle on the dining room table. Try this app with a daily free puzzle and other free puzzles. Alter the puzzle sizes up to 225 pieces and scatter loose pieces outside of the play area. 5) Paperama: I have a lot of games that I turn to to clear my mind but they can end up being pretty stressful. This paper folding game is nice and gentle. Give it a try. (As a bonus, if you love cats and you have some time to kill, try Nom Cat! ).